Elaine Hancock (Olney, United States) on 14 November 2013 in People & Portrait. Taken in Discovery Bay which is about 70 miles east of San Francisco. The dog seems to be right at home! Yes, for some reason, my local River Thames paddle-boarders often have a dog on board. Always looks like an accident waiting to happen to me . . and my cat looks on hopefully. so so beautiful frame, tones, lights, texture & reflections. Perfect...the dog looks so tranquil....excellent to go with one's pet friend to do such things. A marvelous capture! Great job...wonderful details. What a lovely capture Elaine! Yes, beautifully cinematic... amazing light and tone! Excellent backlight. I like, too, dog silhouette, quiet. A marvelous composition with a fantastic atmosphere of trust and love . The tones and light is magical ! Beautifully seen and captured ! Wonderful capture of the moment - love the peaceful outline of the silhouette. @Jason Politte: My dog too! And then the paddle board would start going back and forth and before long, we would be in the water! Very nice - those two - girl and dog seem to feel free. Superb. Beautiful silhouettes. I like that you captured a dog in a silhouette as well. Very beautiful mood. And yes, the dog seems very familiar with this mode of locomotion. Love the light and colour. Original picture with the dog. Wouhaaaaaaaaaa!! j'adore++++ cette superbe photo!! !je te mets 5***** et espère que tu aura 1 spotlight!!! Quel reflet et vue sur sa plange et ces tons dorés merveilleux. Beautiful silhouetted capture with great reflections!! I love the accompaniment of man's best friend. 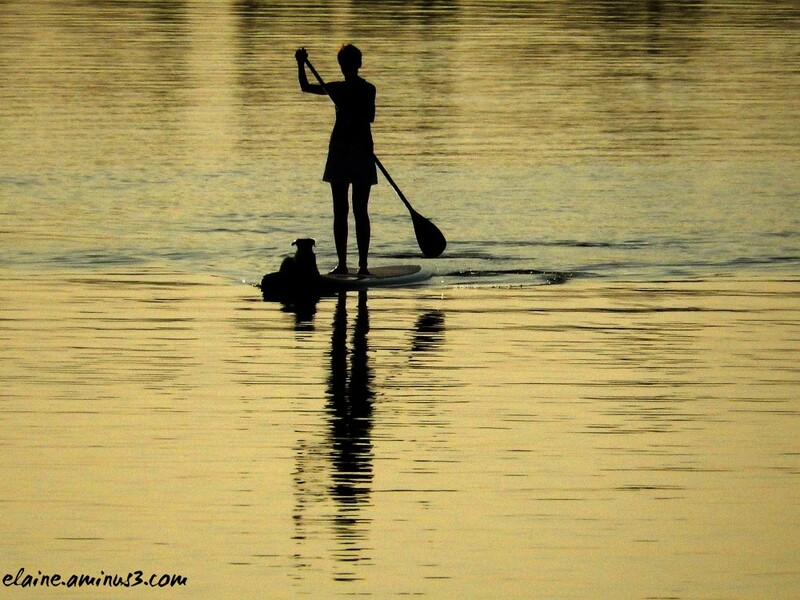 A fine shot of the paddleboarding with the dog. Beautiful water. wow, what a glorious mood, light and compo !!! Nice mood and reflections, beautiful shot ! I like the light and tones. I also like the symmetry of the reflection. Beautiful warm tones, perfect silhouettes and reflections!! A beautiful scene with wonderful golden tones and superb silhouette and reflection ... Excellent !!! Very, very nice. I love the light on the water, and the silhouette is just right. Excellent work. Fabulous photo - serene, wholesome mood! Oh yes, this is wonderful! Well seen and caught. What a peaceful one, I love those colors at the end of the day. The promise of a lovely new dawn. BRavo Elaine. Magnifique ! Silhouettes et reflet en contrejour, et tonalité dorée de l'eau. Awesome capture! Great silhouette, reflection and mood! Cinq etoiles pour ce contrejour en or !